WINNIPEG, MB – The Whiteout is headed to the streets of Winnipeg, and everyone is welcome to join in the celebration. 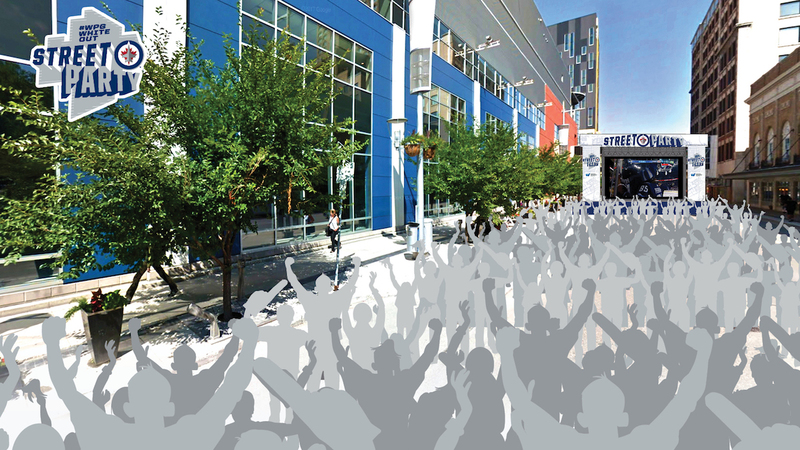 As part of the Winnipeg Jets playoff push, Economic Development Winnipeg announced today that it was hosting a street party, named the Winnipeg Whiteout Street Party. This event gives fans a place to cheer on the Jets while showcasing Winnipeg to the world. The Winnipeg Whiteout Street Party will take place before and during every Jets home playoff game, and will be located on Donald Street between Portage and Graham Avenues. This free family-friendly event will feature two large viewing screens to watch the hockey action live, as well as food and beverages available for purchase on-site. The Winnipeg Whiteout Street Party offers a safe and fun downtown setting for fans to celebrate as a community, while also providing a stage for Winnipeg to showcase the excitement and culture of our city through media who will be covering the Winnipeg Jets from across North America. More details on the Winnipeg Whiteout Street Party will be made in advance of Game 1 of the Jets playoff series.